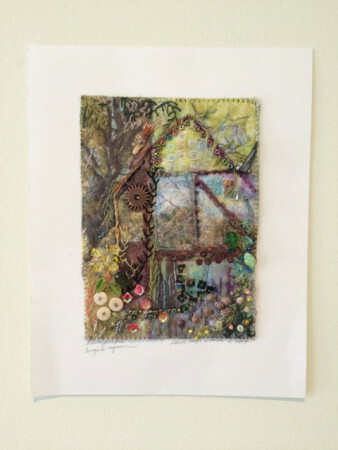 I mentioned in past posts that I was a contributing artist to the 2015 Fiber Art for a Cause. The event was a wonderful success, raising $10,000 in about 2.5 hours on February 4 for the American Cancer Society. Virginia Spiegel deserves a huge congratulations. She has raised over $250,00 in the past 10 years through her efforts. I decided on February 4 that I also wished to bid on an artwork. After struggling a bit with time changes, I managed to enter a bid and be one of the 100 ‘winners’ of an art piece. This week I received my ‘prize’ in the mail – a piece by Laura Cater-Woods entitled Dawn Window. I am delighted! How perfect that I was randomly picked to receive a piece with hand stitching, not to mention delicate beading. I will most definitely be getting a frame for it so it can take a place of honor on my studio wall. I don’t know if you can tell in the photo, but the green tones in the piece work wonderfully with the color of my walls. Receiving Laura’s artwork reminded me of the many adages around giving and that the action of giving is as much a gift to the giver as the receiver. So, here’s an easy opportunity to create some good in the world. Last June, I posted about a fund raising event in Rochester, NY that receives international participation. 6×6 is an annual fete where thousands of small artworks are displayed (in person and online) and offered for sale. The only requirement to participate is that your art work measure 6″ by 6″. It can be created by any media. People then try to purchase the works for $20. The names of the artists are not displayed until after the piece is purchased. The event, which raises funds for the Rochester Contemporary Art Center (RoCo), will take place again this year from June 6 – July 12. It is in its 8th year and each year thousands of artworks are made and donated by celebrities, international & local artists, designers, college students and youths. RoCo is a venue for the exchange of ideas and a not-for-profit 501(c)(3) that was founded in 1977. As a center for thoughtful contemporary art, RoCo provides unique encounters for audiences and extraordinary opportunities for artists through many varied activities throughout each year. If you would like to possibly donate a piece to the event or purchase a piece when the exhibit opens, you can learn more here. I guarantee, you will feel great for doing so! Linking to Nina Marie’s Off the Wall Friday site, check it out! On February 4 you will have the chance to receive one of 100 very special art art works that have been donated to raise $10,000 for the American Cancer Society. It will take just $100 and a speedy internet connection. If you are one of the first 100 to email Virginia Spiegel on Feb. 4, you will receive an art work in the mail. To learn more, just click here. My donation art piece is completed and ready to ship to its new owner. Will you be the lucky one to receive it in the mail? I hope so! I am pleased to be an invited artist for “The 100” fiber fundraiser for the American Cancer Society that Virginia Spiegel has created. On February 4, 2015, you will have the opportunity to vie for being one of the 100 patrons who will receive an artwork from the contributing artists. The piece is entitled Extend Ki. It measures 13.5″ x 14″. The phrase Extend Ki comes from my background in the martial art of aikido and my many years of work with author, Thomas Crum. Ki is a Japanese word that best translates as energy. The many brightly colored shapes emanating from a solid block express the concept of reaching out into the world from our centered base of self. 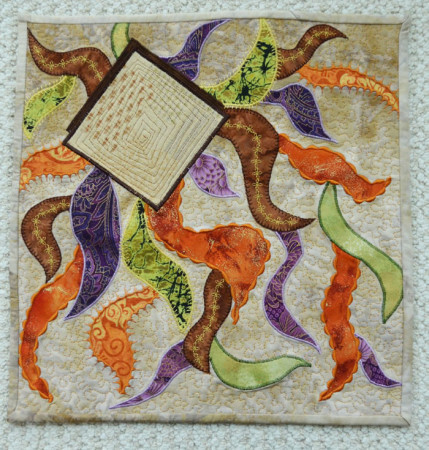 To learn more about how you might be the lucky person to receive this art quilt, or one of the other 99 pieces being offered in this fundraiser, please go to ‘The 100″ website for details. Linking to Off the Wall Friday. Mark February 5 on Your Calendars Now! I am honored to be an invited artist for “The 100” to be held on Wednesday, February 4, 2015. The goal for this fiber fundraiser for the American Cancer Society is to raise $10,000 in one day. How? You guessed it: Virginia Spiegel is at it again! Fiberart For A Cause has already raised $240,000 through the generosity of fiber artists and patrons. In 2015, her goal is to bump that amount up to a nice, round quarter of a million dollars. 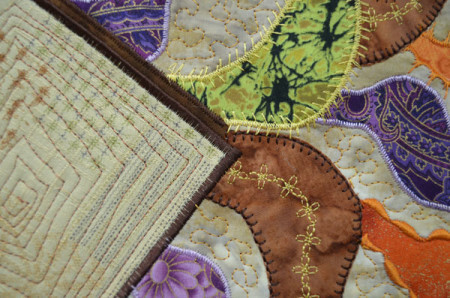 I’m sure you will want to be one of the very exclusive 100 patrons who will be randomly assigned artwork from an extraordinary line-up of international fiber artists. Remember! Mark your calendars now!